Well, I am in love with the latest release by My Favorite Things! 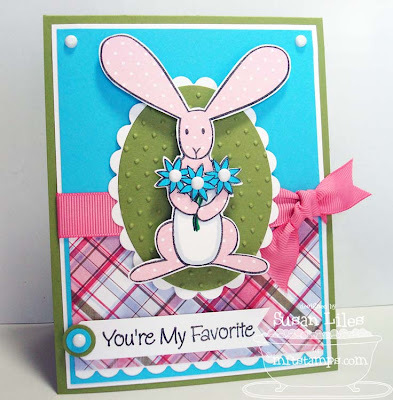 As if making THIS Cuddle Up Carter card wasn't enjoyable enough, these two were super fun to make as well! I couldn't recall if anyone had paper pieced Flopsey lately, so I gave it a try, but left her belly white. I stamped an extra set of flowers, colored and cut them out, then popped them up with a glue dot for a little sumthin' sumthin'. 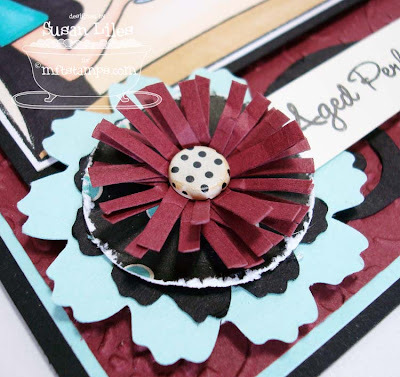 I know it's an unusual color combo, but I think this Flopsey's Flowers card turned out cute! 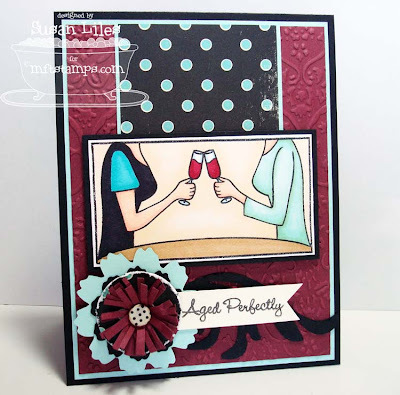 I'm not really a dark wine drinker, but when I was choosing the colors and paper for my Girls Night Out card, these just came together so easily! I'm tellin' ya--these cards practically made themselves! The EXTRA FUN part was coming up with that fabby flower!! The die-cut flowers were made with my Slice machine. Did you see the ones Jen made HERE? On top of mine instead of a prima and a button (I will have to use that idea later! ), I added a distressed circle from the dotted paper. Then my favorite part--the burgundy spikey layers! I colored my brad with a Copic marker to make it not so "white" and cut the swirly with my Slice (can you tell I love that thing? I'm so happy that Michael's is now carrying some of the line of products for it!) It was fun making my own embellishment and the great thing about it---it matches perfectly! I'm super excited about this card and can't wait to make some more of these flowers! Next time, would you like more details as to how I did it? We'll see....JLMK! SUSIE Q-TIP: I keep my Cuttlebug handy at all times. It sits on the floor right next to me and my other Cuttlebug supplies are close at hand as well so I can just pop it up on my desk when I need to use it. My theory is that if your tools are easy to get access to without getting up, you will use them more often which gives you more creative options. Is that sort of like ergonomics? Soooooooo lovin' your Flopsey card! I *need* this set!